When Falcon’s current owners acquired the bank in 1995, the staff consisted of only 20 employees and $52 million in assets. Today, with the benefit of steady leadership, talented employees and a loyal clientele, Falcon is now the 48th largest bank in Texas and is proud to have over 350 dedicated bankers on its team, in addition to assets of almost $1.2 Billion and seventeen branches located in Laredo, San Antonio, McAllen, Brownsville, Eagle Pass, Del Rio and Buda, as well as a loan production office in Austin, and representative offices in Monterrey and Guadalajara, Mexico. Guided by Faith... Grounded by Family... Committed to You! Ranked in 2018 among the 100 highest performing community banks in the 21st century, by one of the premier bank rating companies, Sheshunoff Information Services, Falcon International Bank is proud to have over 350 dedicated team members, in addition to assets of $1.2 Billion and 17 branches located in Laredo, San Antonio, McAllen, Brownsville, Eagle Pass, Del Rio and Buda, as well as a loan production office in Austin, and representative offices in Monterrey and Guadalajara, Mexico. Falcon is the 48th largest bank in Texas ranked by one of the leading Investment banking firms in the US, Banks Street Partners and ranked five stars by BauerFinancial, Inc., an independent financial rating agency. But this is not where we started. In the 1950s, Hugo A. Gutierrez Sr. lived in a modest owner-financed home in Laredo, Texas. He was an independent electrician, and after being awarded what was, for him, a significant job, he needed to borrow $5,000 for materials. He approached a local bank for a loan, handing over all the titles to his work trucks. What came next was a shock: The bank officer told him that his bank was not a pawnshop. It was ridiculous, the officer said, to expect to be loaned money based on car titles. He would need tax statements, profit and loss statements, tax returns, business plan, pro-formas, cash flow statements, letters of recommendation from his most loyal customers, and more. Mr. Gutierrez, Sr. walked out feeling like a failure. It wasn’t that the bank required more documentation than he possessed—it was the disdain he was shown. The dismissal of him as ignorant and unworthy. He pledged never to put himself in a situation like that again. In 1986, Mr. Gutierrez, Sr., now a trusted, longtime Laredo businessman, was invited to join the board of directors of a new bank, then called Falcon National Bank. He had never forgotten the way the bank officer had made him feel, and his earlier pledge changed: Falcon would be the bank he wished had been there in his youth. It would treat every customer with respect. No—it would treat every customer like family. In 1995, Mr. Gutierrez, Sr. and his own family purchased a majority interest in the bank, and he contributed his invaluable business experience to his new role as chairman of the board. His sons, Hugo Jr. and Adolfo, joined him on the board, and Adolfo also became the bank’s president and CEO, a position he held for nearly a dozen years. In that time, Mr. Gutierrez Sr.’s business savvy and devotion to family created a business model that still guides Falcon throughout its growth. Today, Gilbert Narvaez, Jr., an integral part of Falcon since 1992, serves as president and CEO, and after decades of treasured business advice from his father, Adolfo serves as Falcon’s chairman of the board. 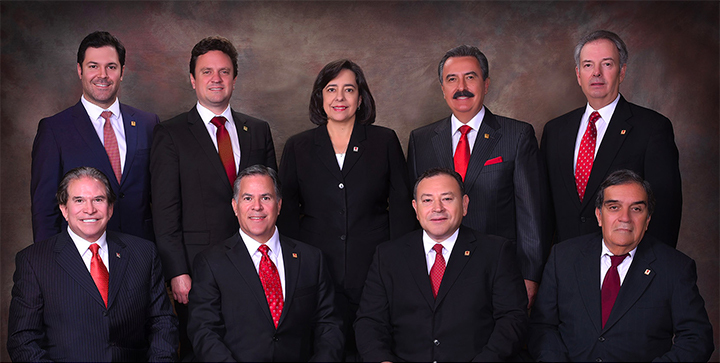 Mr. Narvaez, Jr., John J. Hill, Hugo A. Gutierrez, Jr., Ray A. Gonzales, Eduardo Garza-Robles, and Pablo Villanueva also add their banking and business expertise to Falcon’s board of directors. AJ Gutierrez serves as an advisory board member. Mr. Gutierrez Sr. always said, “Family is everything. La familia es todo.” From this credo came Falcon’s unique approach to banking, guided by three principles: faith, family, and Falcon. While our focus on customer service consistently earns us the Five-Star Service Award from the Laredo Chamber of Commerce, we are also committed to leading the way on products and services that put you first. Over the years, that has included free personal and business checking, interest checking, Internet banking, mobile banking, snapshot deposits, bill pay, P2P transfers, and more. At Falcon, family extends to our communities. We are proud to serve as volunteers, contributors, and board members of the American Cancer Society, American Heart Association, March of Dimes, Susan B. Komen Foundation, Junior Achievement, Leadership Laredo, S.T.A.R.S., Rotary Clubs, Habitat for Humanity, United Way, Goodwill and more. Almost 70 years after Mr. Gutierrez, Sr. walked back to his truck, titles in hand, we promise never to forget that serving you is a privilege—and our mission. We look forward to continuing to grow together . . . as a family.